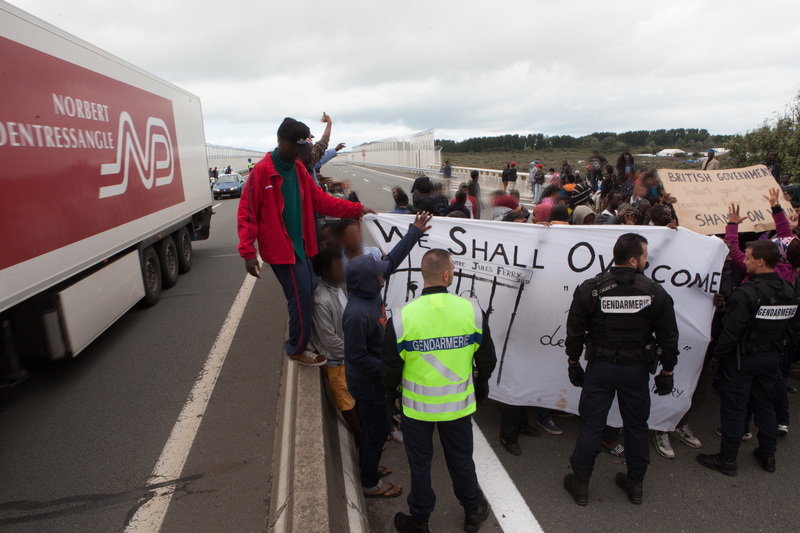 The name of our group is Calais Migrant Solidarity. But we are also widely known, particularly amongst people in Calais, as “No Borders”. This sometimes causes a bit of confusion: the thing is, really, “No Borders” isn’t a group or organisation, it’s an idea. Calais Migrant Solidarity started in 2009. It was a project that came out of the “Calais No Border Camp” of that summer, in which hundreds of people from across Europe and further afield came to camp on the outskirts of the town, take action against the border and make connections with people without papers here. Other “No Border Camps” have been held over the years at important border points such as Lesvos, or at centres of the European Border Regime such as Brussels and Frankfurt. And there are various groups that choose to use the name “No Borders”, like No Borders Morocco or the “permanent No Border camp” at Ventimiglia. Some of these groups and individuals may have worked together, others not. There is no one No Borders organisation: anyone can use this name if they share the basic idea. And the idea is pretty simple, it’s in the name: we are against borders. Borders create misery and death. They are a cruel fiction, a weapon of divide and rule. They serve the rich, who use them to protect the wealth hoarded by colonialism and capitalism, and to turn the rest of us against each other. (If you’re a millionaire, of course, you have no problem crossing borders at all.) In fact, borders don’t really stop that many poor people from getting into rich countries. And maybe that’s not really the point at all. Borders create an illusion of control, while setting up poor migrants as a cheap labour force of “illegals”, who can be both easily exploited and easily made into scapegoats. Is a world of no borders possible? Is a world without tyranny, exploitation and oppression possible? Maybe not in our lifetimes, maybe never at all. But should that stop us from fighting against these things where we can? 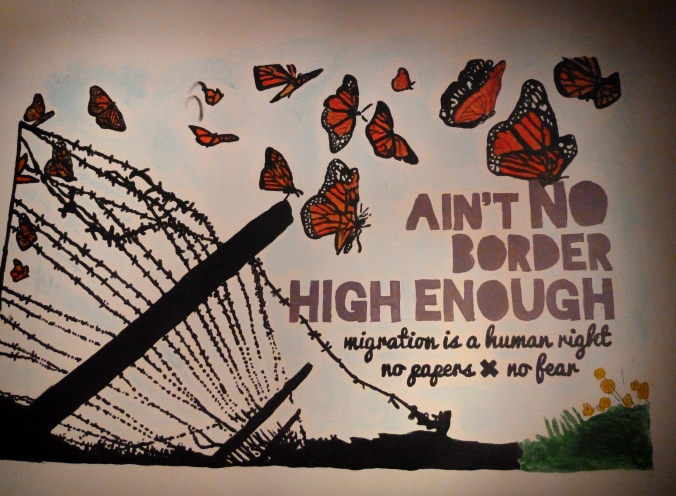 For further reading, here is a No Borders Manifesto which was not written by our group. No Borders people are circulating this statement below in Calais, as one small move to help push political debate here. Hopefully other groups and individuals, especially from the migrant communities here, may also make their own statements. This is an interesting time in Calais. The numbers of people trapped here are increasing very rapidly. The French state’s continuing attempts to control the ‘problem’ with repression — beatings, gas attacks, evictions, more cops, more deaths … — look ever more futile. There may be new opportunities to shift the political landscape here: when even the state is starting to talk about the need for ‘migrant houses’, and right-wing politicians are calling to break the ‘Le Touquet’ treaty with England, there are cracks emerging in the status quo. But we can’t hope for any positive change so long as we let discussions about this murderous border continue to be dominated by politicians and mainstream media. So far this text is in Arabic, English and French. It would be great if anyone can help translate into other languages (particularly useful would be Pashto, Farsi/Dari, Tigrinya, Amharic). It would also be great if anyone of an artistic bent would like to help design posters using this text or a shortened version. Why are the French police guarding the UK border? There are now over a thousand migrants in Calais, and the number is growing. They don’t want to be here, they want to be in England. So why are the French police trapping them here? In 2003 the French Government signed the ‘Le Touquet Treaty’ with the British Government. France agreed to police the border in Calais. Britain pays them millions of euros to do it. Why are there any borders at all? Borders are not made for our safety. They are made by governments and their friends in business to separate us, to create fear and division.The same politicians and businessmen start the wars and famines in Africa, Asia and the Middle East that chase the refugees from their homes. Borders, like war and poverty, make profits for the rich, and keep us fighting amongst ourselves. The migrants are not our enemies. Our enemies are the politicians and capitalists who are a menace to us all. 1. We call for a safe place of welcome where migrants can stay in Calais, with proper shelter and hygiene, and free from violence including from the police. 2. We call for an immediate end to the Le Touquet treaty. Take the border away from Calais. 3. We call for an end to all borders. Let human beings move freely. Let us come together to fight our common enemies and make a new world. Pourquoi ce sont des policiers français qui gardent la frontière pour le Royaume-Uni ? Il y a actuellement plus d’un millier de migrant-es à Calais et le nombre est en augmentation. Ils-elles ne souhaitent pas être ici, ils-elles veulent être en Angleterre. Alors, pourquoi la police française les piège-t-elle ici ? En 2003, le gouvernement français a signé avec le gouvernement britannique «Le Traité du Touquet». Par ce traité la France a accepté de servir en tant que police des frontières à Calais. La Grande-Bretagne lui verse pour ce faire des millions de d’euros. En fait pourquoi y a-t-il des frontières ? Les frontières ne sont pas faites pour notre sécurité. Elles sont établies par les gouvernements et leurs partenaires en affaires afin de nous séparer, pour créer des peurs et nous diviser. Ce sont les mêmes politicien-nes et hommes-femmes d’affaires qui sont responsables du déclenchement des guerres et des famines en Afrique, en Asie et au Moyen-Orient et qui de ce fait chassent les réfugié-es hors de leurs foyers. Les frontières, comme la guerre et la pauvreté, permettent aux riches de faire des profits, et nous entrainent dans des luttes entre nous. Ce ne sont pas les migrant-es qui sont nos ennemi-es. Nos ennemi-es sont les politicien-nes et les capitalistes qui sont une menace pour nous tou-tes. 1. Nous demandons un lieu d’accueil sûr où les migrant-es puissent rester pendant leur séjour à Calais, s’abriter, maintenir une bonne hygiène, à l’écart des violences, y compris policières. 2. Nous appelons à la fin immédiate du Traité du Touquet. Emmenez la frontière loin de Calais. 3. Nous appelons à mettre fin à toutes les frontières. Que les êtres humains puissent se déplacer librement. Rassemblons-nous pour combattre nos ennemi-es communs et créer un nouveau monde. عام 2003 وقّعت الحكومتان الفرنسية والبريطانية (اتفاقية توكيه)، والتي وافقت فرنسا بموجبها على حراسة الحدود في (كاليه). وتدفع لها بريطانيا ملايين اليوروهات لفعل ذلك. الحدود ليست من أجل أمننا. لقد وُضعت الحدود من قبل الحكومات وأصحاب الأعمال من أجل تقسيمنا وخلق الخوف والانقسام. هؤلاء السياسيون ورجال الأعمال أنفسهم هم من يبدأ الحروب والمجاعات في إفريقيا وآسيا والشرق الأوسط، والتي تتسبب في مغادرة اللاجئين لبيوتهم. والحدود، كما الحرب والفقر، صناعة مربحة للأغنياء وتبقينا نتصارع فيما بيننا. المهاجرون ليسوا أعداءنا. أعداؤنا هم السياسيون والرأسماليون الذين يتسببون في الأذية لنا جميعاً. 1. نطالب بمكان آمن يرحّب بالمهاجرين حيث يمكنهم الإقامة في كاليه، يؤمن لهم الحماية والنظافة، ويكون خالياً من العنف، بما في ذلك عنف الشرطة. 2. ندعو إلى إنهاء اتفاقية توكيه فوراً وإبعاد الحدود عن كاليه. 3. ندعو إلى إنهاء جميع أشكال الحدود. اتركوا الناس يتحركون بحرية. لنتحد ولنقاتل معاً ضد عدونا المشترك ونبني عالماً جديداً.